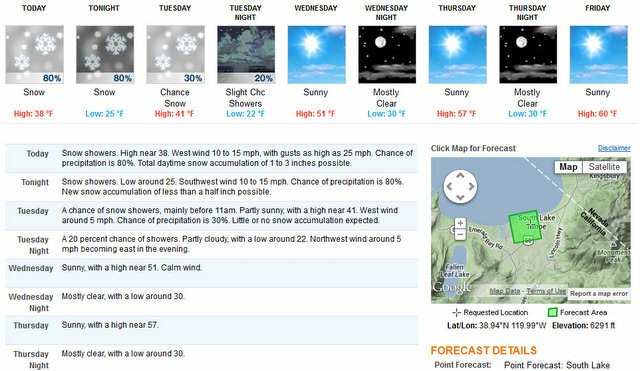 Truckee, CA…The following is the NWS Reno office’s forecast for the Greater Lake Tahoe area. Today: Snow showers. Snow accumulation of 1 to 3 inches. Highs 33 to 43. West winds 10 to 15 mph. Gusts up to 30 mph in the afternoon. Ridge gusts up to 50 mph. Tonight: Snow showers. Snow accumulation up to 2 inches. Lows 22 to 32. Southwest winds 10 to 15 mph. Tuesday: Mostly cloudy. Chance of snow showers in the morning… Then slight chance of showers in the afternoon. Highs 35 to 45. West winds around 10 mph in the morning becoming light. Tuesday Night: Partly cloudy in the evening then clearing. Slight chance of showers. Lows 17 to 27. Light winds. Wednesday: Sunny. Highs 45 to 50. Light winds. Wednesday Night: Clear. Lows 23 to 33. Thursday Through Friday Night: Clear. Highs 53 to 58. Lows 23 to 33. Saturday: Partly cloudy. Highs 53 to 58. Saturday Night: Breezy. Mostly cloudy. Lows 22 to 27. Sunday: Mostly cloudy with a slight chance of showers. Highs 43 to 53.